the Marines dont have that problem"
Watch it, enjoy it and NEVER FORGET! I never did since the same happened in Communist Romania! Hence my hatred of tyrants everywhere! I DO NOT read NYtimes and DO NOT watch CNN or even get close to the hated BBC... The only balanced reports you will find in NYpost.com , Jpost.com , nationalpost.com , nationalreview.com ... can watch FOX news, maybe MSNBC... Nothing else! Thank our troops(10 mil signed already) Support our troops Adopt a soldier! New! VIDEO:Who are those peaceniks? Must see! San Francisco New York Broadband Check out my WEASELS ESSAY! 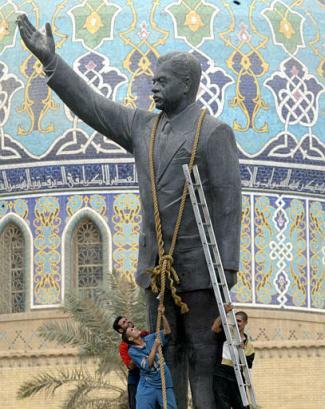 "I'm 49, but I never lived a single day," said Yusuf Abed Kazim, a Baghdad imam who pounded Saddam statue's pedestal with a sledgehammer. "Only now will I start living. That Saddam Hussein is a murderer and a criminal." "Now my son can have a chance in life," said Bushra Abed, pointing to her 2-year-old son, Ibrahim as they watched the statue come down in central Baghdad. "Oh, the Iraqi people are happy now," said Flaih, 49, a former Iraqi army officer who arrived in New Hampshire with his wife and two sons 2 years ago. "It's the happiest moment in my life. It's my liberation day." "It's beautiful," said Derweesh, 32, a Cleveland surgeon whose family left Iraq when he was 9 years old. "I cried tears of joy." OP. 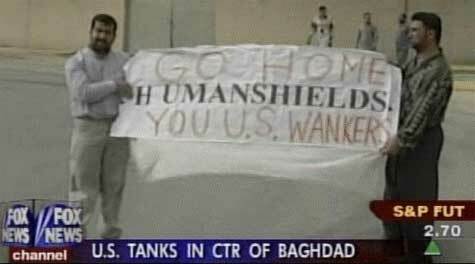 Iraqi Freedom nearing victory! - Faster than I expected and all those losers predicted! Joy and exhultation on the streets of Baghdad (reminds me of the collapse of Communism in eastern Europe - was such a rush for millions including myself!). The Arab world again cannot grasp the facts- same as when Israel was victorious in the past...they call for pan-arab fight! Empty words of bravery, lies, deceit and false pride is the rule in those Moslem countries. Lighten up retards! We're living in the 21st century not in a AliBaba's times! 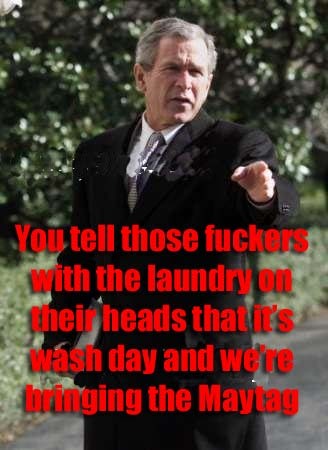 The animation above is for the mobs of zombies in the streets that claim Bush is more of a menace to the world than this BUTCHER! Hope you feel good about it! "In one incident, Iraqi troops raised a white flag of surrender - only to attack their approaching captors with artillery fire. In another, he said, a group of "civilians" made motions to surrender and then opened fire when American marines came forward." They deny having chemical weapons however thousands of chemical protection military suits were found fully equipped with nerve gas antidotes. Ever wondered why? They shoot Iraqi soldiers that try to defect in a most atrocious way : they dress in American uniforms. If any Iraqis surrender to them they shoot them! They keep Iraqi soldiers at gunpoint and threaten to shoot their families in order to coerce them to fight! They hanged a woman for waving to coalition planes! These are subhuman beasts that thrive in tyrannies (I've seen that in Communism before). Israel has been battling similar monsters with little backing from the West. Time to bomb Saddam - hilarious cartoon! The 1936 pre WW-II Munich Agreement was popular with most people in Britain and ALL OVER THE WORLD because it appeared to have prevented a war with Nazi Germany. Now the peacenik weasels do it AGAIN! CHECK OUT MY ESSAY! WAR IS JUST WHEN IT SAVES THE LIVES OF INNOCENT PEOPLE, IT SECURES WORLD PEACE, AND ELIMINATES DESPOTS. THINK OF THE TORTURED UNFORTUNATE SOULES KILLED CONTINUOUSLY BY HIS REGIME AND UNDERSTAND THAT EACH DAY THAT PASSES ONLY CONTINUES THE KILLING. THIS IS THE PRICE OF YOUR INACTION! Oh Jews! Alah Akbar! >Jihad (holy war) for Allah! Victory to the believers! Click here for Saddam humor, cartoons, etc..
New! Link of the day: http://www.hawaii.edu/powerkills Democracies tend to be less aggressive than tyrannies. See also chapters on democides in the 20th century... Revolting and shocking! Following the collapse of Communism, America needs to change it's cold war era doctrine. No more support of dictatorships such as Saudi Arabia and Egypt just for the sake of Communism containment. We should engage world's democracies in active economic and diplomatic sanctions in order to collapse dictatorships in North Korea, Iran, Syria and Libya! Tyrannies, dictatorships and despots not only bring grief to their own countries but also are more aggresive and war-oriented toward their neighbors as seen in the above link! 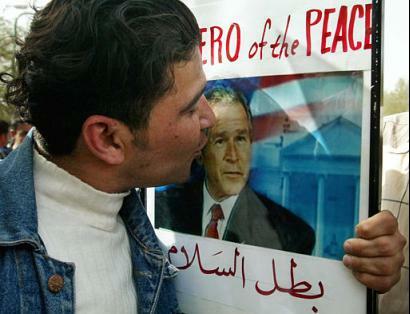 Link to several articles written during Operation Iraqi Freedom.